There is a reason that Ocean Beach has stayed as OB and did not suffer the fate of, say, its neighbor to the north – Mission Beach. Have you been up to Mission Beach lately? Walked or biked on the Boardwalk? Surfed the MB curls? Did you realize there’s no community left there? It’s all time-shares, vacation rentals, and empty buildings. But most importantly for us, it’s practically wall-to-wall 3 story expensive giants facing the ocean for – literally – miles – all along the famous Boardwalk. And the reason OB didn’t go that way is because of urban planning tools and the unique planning document known as the OB Community Plan. The OB plan has been the blueprint for construction and development in OB since the mid-1970s when it was finalized. Ever since then, the OB Planning Board has operated with volunteers to follow that OB Plan. 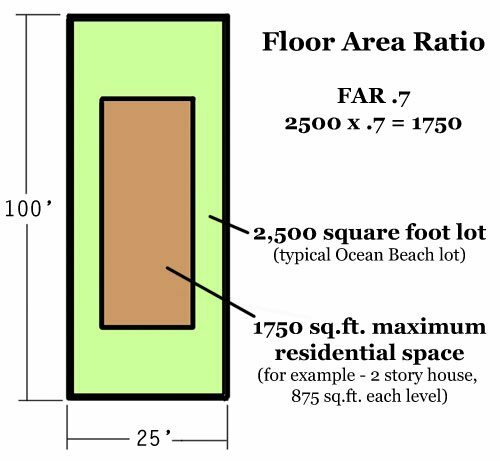 One of the major tools the Planning Board has used to limit bulky over-development here in the Land of OB has been the FAR – the Floor-Area-Ratio. In the coastal sections of OB, the FAR is 0.70. In contrast Mission Beach has a much higher FAR which allows developers to construct mammoth buildings that crowd out the beach. In terms of density, most of OB is roughly 8 to 10 units per acre. One way density is controlled is through a calculation determined by the size of the lot and the size of the building being planned. It’s called the FAR – the Floor Area Ratio. This is a ratio between the size of the building over the size of the lot. So, think this through. If you have an FAR of 1.0 – that means you could build out to every inch of your lot, right (not counting setback requirements yet)? If allowed, you could do this several ways. You could build out to the property line with one story. Or you could build two stories, each with 50% of the lot, or 3 stories, each with one-third, and so on. Of course, there are all kinds of set-back requirements, side yards, parking issues – which prevent you from building out to your property line, but we aren’t dealing with them right now. Now, if you have an FAR that is less than 1.0, then you have restrictions of how far out or how high you could build. The FAR in Ocean Beach is 0.7. So is a lot of Point Loma. In comparison, much of the rest of San Diego is 1.2. So, in general, we find that building in Ocean Beach – at the coast – is more restrictive than in the rest of the city. Makes sense. So, take your typical OB lot, a residential plot. It’s got a 25 foot length across the front and is 100 feet deep. Okay, so the square footage for the lot is 2500 square feet. If the FAR for that lot is .7, then the maximum ratio of the building being planned to the land is .7, or 70%. And seventy percent of the 2500 sq. ft. lot is 1,750 square feet. That is the total size of the building that can be built on that type and size of lot in OB. So, since this is your typical OB lot – in a certain and dramatic way it’s also the standard lot. Keep this in mind for later. Now, we already said that the area zoned RM2-4 is your area west of Sunset Cliffs Blvd – with Sunset Cliffs being an obvious north-south dividing line in the community. Now, here’s an anomaly: according to the City’s development code, a minimum lot in the RM2-4 zone is 6,000 square feet. Well, think about it – this is OB. There are no single lots in OB of that size, no single lots here in OB with 6,000 sq. ft. Well, you might say, okay, Ocean Beach is the exception in that zone. Yet according to research done by a Planning Board member, outside OB, there’s only about a dozen parcels in the entire city that are zoned RM2-4. Or in other words, 99% of the parcels that are zoned RM2-4 are in OB. Except for some exceptions. This means, ‘no, OB is not the exception in this zone, it’s the rule, it’s the standard.’ The Code is wrong. One of the other requirements and restrictions to building is the parking element. Under the requirements of the RM2-4 zone in the OB Precise Plan, the building must include enclosed parking. So, that 1,750 square foot area must include an enclosed parking space, which usually makes up 25%. What does all this mean for OB today – June 2014? You may have heard that the San Diego Planning Commission dissed the new Update to the OB Community Plan. And now OB is gearing up for a show down at the June 30th meeting of the full City Council. There’s a facebook page in support and there is an important Petition to Support the OB Community Plan. Download and print out the Petition, and circulate it among your neighbors and friends. And return it to the Planning Board or drop it off at Dog Beach Dog Wash.
With the changes the Planning Commission wants OB’s Community Plan might as well be called the ‘South Mission Beach Community Plan’. I have email news “alerts” for OB, Point Loma, Mission Bay and Mission Beach. The only alerts I receive about Mission Beach are rental ads or for sale notices. It’s sad. Over the years, I have watched as Mission Beach lost its only elementary school, its post office, a free medical clinic, and possibly its soul. I often bike around Mission Bay, and when I’m on the Mission Bay bike path, many of the buildings are closed up – no one’s there. I think the “free” clinic might still be there, in some sense…Christina forced me to go see a doctor when I stopped breathing and collapsed in the kitchen a couple years ago, they asked me about my income, charged me $140, and I had a 5 minute chat with the doc who advised me to take two aspirin and call her in the never. Dave – it’s true that there is still a low-pay medical clinic in MB. I was referring to the “original” one where I worked for 6 years. It was not free when I was there, but like we charged patients $2 a visit in the early 80’s. Gradually, as funds for non-profits dried up and as the local patient base in MB dried up, the clinic could not survive as a non-profit and was bought by a system of clinics. It was the Beach Area Community Clinic, and it had a great Women’s Health Clinic, a psych unit, outreach and PR programs, etc. I worked there for 6 years, met my daughter’s mom there. And, the people who worked there over the years have once-in-awhile get together reunions. Nancy Casady – the CEO of People’s – worked there. I remember it well, I got a series of shots there in 1979 before a long trip down through Central America. It was a great service. I met a New Zealand couple there, folks from all over used that clinic. I ran into them sometime later in a cafe in Mexico City, very cool. “See the line of Indians leaving Rancho Malario to make room for YOU!” We could be the Indians. The enclosed parking requirement is not “usually” 25%, it’s mandated to be 25%. Of a 1,750 sf. structure that limits the structure to 1,312.5 sf. with 437.5 sf. of dedicated parking area… a pretty generous parking area in my opinion. Another ramification of RM-2-4 is that if there’s parking on the ground floor, 40% of the ground floor must be habitable area… so, no garages comprising entirely the first floor in OB. Though I’m not sure why this is the case or who it helps. I’m also unsure of why the precise plan, the OBPD or anyone else involved in the matter isn’t addressing density. Why don’t the 25×100 lots allow for two units as is often the case of buildings that have been grandfathered in OB? What’s obvious is that RM-2-4 is not the correct designation for OB but no one is trying to change that, instead focusing on limiting every 3-story house that’s going to eventually go in on W. Point Loma to 1,312.5 sf. Your eye isn’t going to notice the missing 400 sf. from the street. They’re still going to be 30 feet high, they’re still going to replace the duplex that once stood in their place and no one in OB is still going to be happy about it. The point is to halt the construction of these 3-story houses, and get them to scale back to a design that fits with the character of OB. I understand that. I just don’t think shaving off 400 sf of house is going to achieve the results everyone’s after. I think if we had had the foresight to write the height limit as “30′ for peaked roof, 22′ for flat roof”, that might have done better to help preserve WPL from gentrification. Ok, well back to my point on density: Even if one complies with the FAR and doesn’t request the 25% parking area variance as the houses on WPL have, a 1,300 sf. single family residence is still about 200 sf. bigger than the community character everyone wants to maintain. But with the ability to put a duplex on a 25×100 lot you wind up with two units at a max of 875 sf. without the parking area requirement – which is very much in line with community character. Density needs to be discussed. This FAR issue is distracting from what OB really wants. Parking is already a severe problem in OB – ever been down Muir at night? The mandated parking area allotment and the parking count are two distinct things. The required parking on a lot is dependent on the type of development and doesn’t change without a variance or deviation of its own. Whether or not these houses are receiving a variance for the 25% required parking *area* they still need to comply with the parking ratios per table 142.05C. The parking requirements may be poorly written, but I would say that we need parking requirements, not just to avoid additional stress on street parking caused by new construction, but to ensure that redevelopment resolves parking stresses caused by previous construction that didn’t include adequate parking. I think it’s reasonable to demand a standard size parking space for each bedroom, tandem permitted only for multiple bedrooms in a single living unit. I don’t understand the 40% ground floor restriction, it seems to me that 2-story carriage house would not be out of character for OB. There are also locations like the vacant lot on Santa Monica, where below ground parking would still be at or above the grade of the street and would make perfect sense (given it could be built without destabilizing the adjoining properties). When I was on the PCPB, we had to watch the parking features like a hawk, the City did not. Your the first voice of reason I’ve heard from OB. And yet, Mission Beach has one of the strongest Women’s Clubs in San Diego. Go figure. It’s true, but it’s like that old church that still stands in the neighborhood where all the parishioners have moved away yet return every Sunday to the old hood. I had a great-aunt who was a member and who lived in the neighborhood years ago. It is so sad to see the walled off boardwalk where there is no more sense of community left. In OB, history seems to be repeating itself with the same struggles from outsider developers/a few insiders, ignoring the community character and history, just wanting build big, big and bigger! O.B. is special and doesn’t need to fad off into gentrification. 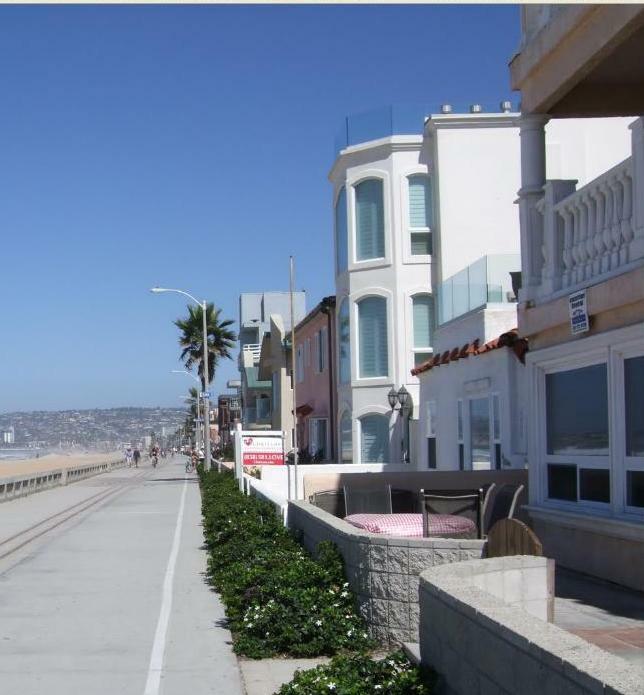 Tell the politicos that spouted taking care of neighborhoods to keep us a neighborhood, a real beach town! I love OB. I’ve only been in OB for 8 years, though born and raised along the coast in Southern California. With the influx of people, limited housing, and desire for coastal living, it is inevitable that coastal communities will change. What sets OB apart from other places is its soul. That is more important than the height of buildings. They’re connected. The only reason OB still has a soul is that they don’t just let anyone build anything they want here. You think that is the “only reason OB still has a soul is that they don’t just let anyone build anything they want here”???? Does that mean places with tall building have no soul? Yeah, places with huge tall buildings and malls full of generica have no soul. That’s exactly what it means. False equivalence. No one is saying people can’t redevelop or remodel. Channel 10 News interviewed me and Mindy Pellessier today and they broadcast a fairly good story tonight at 6pm.